On June 15, 2006, President George W. Bush created what was at the time the largest marine protected area in the world. 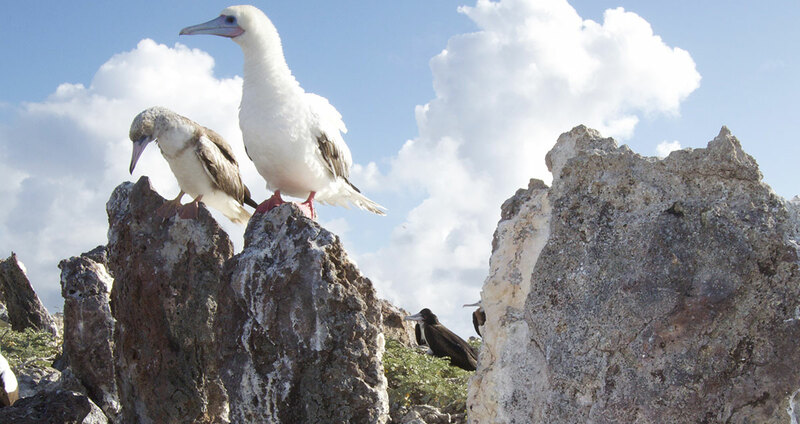 To mark this anniversary, we're looking back at 10 years of conservation of one of the most remote groups of islands and atolls in the world—Papahānaumokuākea Marine National Monument. The Northwestern Hawaiian Islands Marine National Monument, later named Papahānaumokuākea, was established by Presidential Proclamation 8031 on June 15, 2006 using the Antiquities Act. It was created to protect an exceptional array of natural and cultural resources. It encompasses 139,797 square miles of the Pacific Ocean and is home to more than 7,000 marine species, one quarter of which are found only in the Hawaiian Archipelago. When Papahānaumokuākea was first created, less than one percent of the ocean was protected. 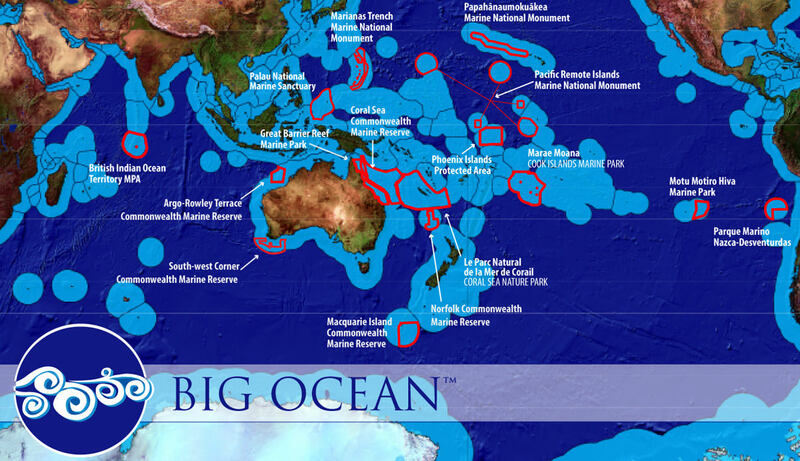 Today several large scale marine protected areas add up to nearly three percent of the global oceans. If the current sites were put together, they would be the second largest country in the world, bigger than the United States. On July 30, 2010, Papahānaumokuākea was recognized for both its natural and cultural importance and was inscribed by the United Nations Educational, Scientific and Cultural Organization (UNESCO) as the first "mixed" World Heritage site in the United States. Located in the Northwestern Hawaiian Islands, the shallow reefs and sandy shores of Papahānaumokuākea collect marine debris from all areas of the Pacific. NOAA and partners work regularly to collect and remove marine debris. Marine debris can be made up from anything to microplastics to large derelict fishing gear—including one net that weighed more than 11 tons! Virtually every research expedition to Papahānaumokuākea yields new discoveries, including 22 historic shipwrecks, more than 70 new species of algae, 13 new seamounts—some of which are over 14,000 feet in elevation, the oldest marine organism in the world—a deep-sea black coral that can live up to 4,500 years, the world's largest sponge, the largest gorgonian coral ever found, reefs with 100 percent of fish unique to Hawaii—this is the highest level of endemism from any known marine ecosystem on Earth, and presumably more to come! The name Papahānaumokuākea (pronounced Pa-pa-hah-now-mo-koo-ah-keh-ah) comes from an ancient Hawaiian tradition concerning the genealogy and formation of the Hawaiian Islands. Papahānaumoku is a mother figure personified as the foundational earth from which islands are born and Wākea is a father figure personified in the expansive sky. Their union resulted in the creation, or birthing, of the entire Hawaiian archipelago—thus the naming of the monument is to honor and preserve these names, to strengthen Hawaii's cultural foundation and to ground Hawaiians to an important part of their history. Through the work of NOAA and partners, 463 Hawaiian monk seals have been saved through a variety of interventions. These include disentangling seals from marine debris, translocating them to areas with greater safety or food, providing medical care, reuniting pups with mothers, or rehabilitation. Soon after Papahānaumokuākea was established, Native Hawaiians used traditional wayfinding techniques for the first time in hundreds of years to sail to Nihoa in the Northwestern Hawaiian Islands on a double-hulled sailing canoe, Hōkūleʻa. Studies of heiau, or ancient religious shrines, have provided knowledge that have helped with the restoration of several similar sites in the main Hawaiian islands. 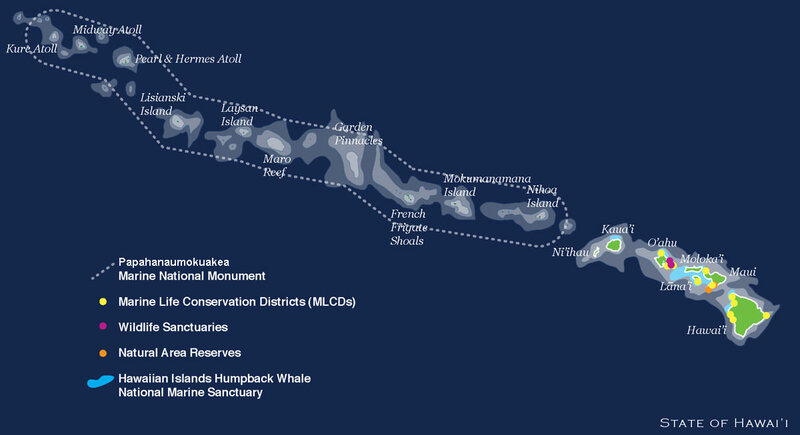 Papahānaumokuākea Marine National Monument is administered jointly by three co-trustees—the Department of Commerce, the Department of the Interior and the State of Hawai'i. The day-to-day management is overseen by a seven agencies: NOAA Office of National Marine Sanctuaries, NOAA National Marine Fisheries Service, U.S. Fish and Wildlife Service - Ecological Services, U.S. Fish and Wildlife Service - Refuges, State of Hawaiʻi - Division of Aquatic Resources, State of Hawaiʻi - Division of Forestry and Wildlife and the Office of Hawaiian Affairs. While going to the Northwestern Hawaiian Islands isn't practical for most of us, you can take a virtual tour. Mokupāpapa Discovery Center is another way to get a sense of the wonders of Papahānaumokuākea. Located in Hilo, Hawaii, Mokupāpapa features a 3,500 gallon saltwater aquarium, interactive educational exhibits, life-size models of wildlife found in the Northwestern Hawaiian Islands, artwork inspired by those islands and Hawaiian culture, and many interpretive panels in both Hawaiian and English.